This is a WordPress plugin created to allow the usage of jQuery Responsive Countdown with Visual Builder tool in your powered by WordPress sites. 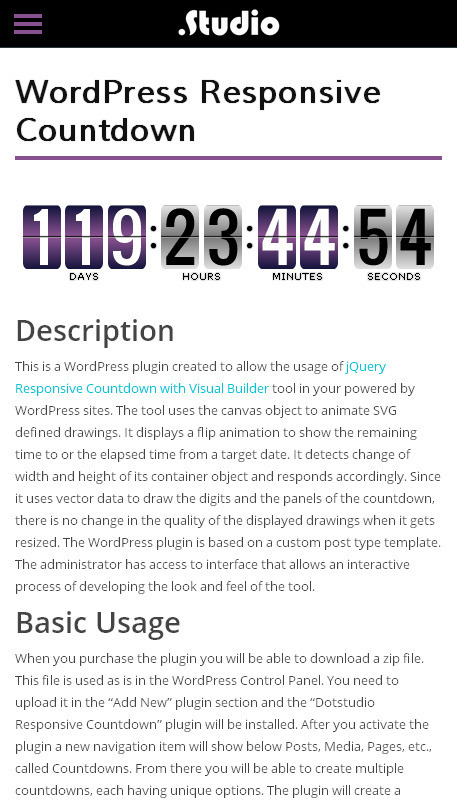 The WordPress Responsive Countdown plugin uses the canvas object to animate SVG defined drawings. It displays a flip animation to show the remaining time to or the elapsed time from a target date. It detects change of width and height of its container object and responds accordingly. Since it uses vector data to draw the digits and the panels of the countdown, there is no change in the quality of the displayed drawings when it gets resized. 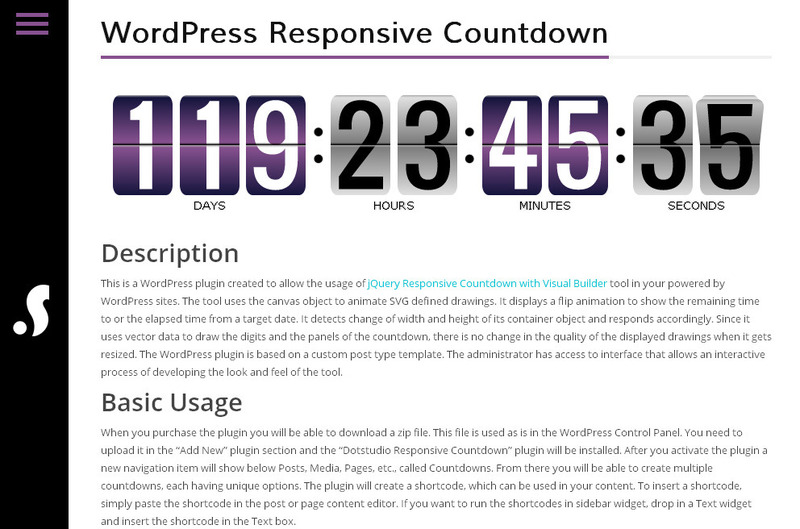 The WordPress Responsive Countdown plugin is based on a custom post type template. The administrator has access to interface that allows an interactive process of developing the look and feel of the tool. Here is a screenshot of the options panel available: Every option from the UI has a help button, that explains more about the usage and shows shortcode examples. When you purchase the plugin you will be able to download a zip file. This file is used as is in the WordPress Control Panel. You need to upload it in the “Add New” plugin section and the “Dotstudio Responsive Countdown” plugin will be installed. After you activate the plugin a new navigation item will show below Posts, Media, Pages, etc., called Countdowns. 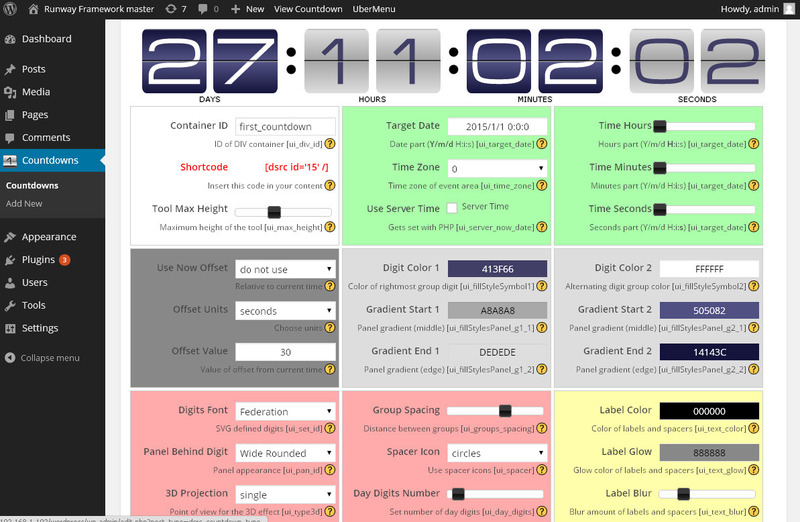 From there you will be able to create multiple countdowns, each having unique options. 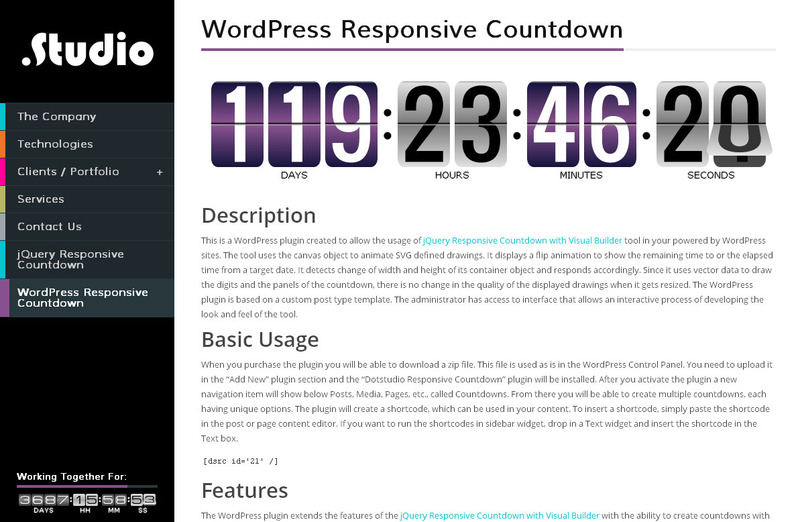 The WordPress Responsive Countdown plugin will create a shortcode, which can be used in your content. To insert a shortcode, simply paste the shortcode in the post or page content editor. If you want to run the shortcodes in sidebar widget, drop in a Text widget and insert the shortcode in the Text box. Count down / Count up. Setting of labels font and size. Groups spacing. Groups divider – circles or squares. - warnings showing in debug mode removed. - ui_target_date is not longer used as shortcode parameter. target date can be overridden in shortcode content. - my_enqueue function name is unique now..
- unexpected T_FUNCTION error fixed for older PHP versions. - no empty lines in JS code, which were getting replaced with paragraph tags in some WP sites.